TODAY, JUNE 4th, IS THE RELEASE DATE! GRAB YOUR COPY TODAY! If you have not pre-ordered this book, today you can BUY IT! I pre-ordered my copy, so it will automatically download for me at 3:00am EST! (Amazon bases new releases, price changes, and more at Pacific Time, which for EST is 3:00am, not midnight. That kind of gives the EST a little bit of an advantage. We can still order up until 3:00am and get whatever product which may be on special until 3:00am. It has ALWAYS worked for me! YES! I LOVED "Losing It"! It was a GREAT love story! (Review to follow). This book is about another character in the book, Cade, and a girl he has met! We'll see! Here is the LINK to purchase the paperback OR you can click on the KINDLE version to download the ebook version! The prices displayed are from Amazon and are subject to change when the book releases. I am writing this as of Monday evening PRIOR to it's release. OMG! You have NOT READ "Losing It" by Cora Carmack? Here it is! 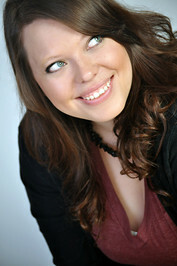 +Cora Carmack is a twenty-something writer who likes to write about twenty-something characters. She's done a multitude of things in her life-- boring jobs (like working retail), Fun jobs (like working in a theatre), stressful jobs (like teaching), and dream jobs (like writing). She enjoys placing her characters in the most awkward situations possible, and then trying to help them get a boyfriend out of it. Awkward people need love, too. Her first book, LOSING IT, is a New York Times and USA Today bestseller. I think she is so beautiful, and look at that glimmer in her eyes! With a glimmer like that, you KNOW these books are excellent! I guarantee it! I LOVED Losing It! It is one of my favorites for 2013! I can't WAIT to read Faking It! I happened to see Cora on an interview on Nightline, along with +Colleen Hoover! It was GREAT! When she was interviewed, they asked her about writing the book. She said she was on a 3 week break from College. Went home, wrote the book, and listed it on Amazon. She figured if she could make some money off of it, great! Little did she know it was headed for the New York Times Best Seller List AND the USA Today Best Seller List as well! AMAZING, huh! After you read these books, you'll see why they made the list! ENJOY! So after reading that, I say: FOLLOW YOUR DREAMS! You never know where they will take you!